I am the Jaded Blossom Guest Designer for December 31st! I appreciate getting the chance to showcase a few Jaded Blossom products! 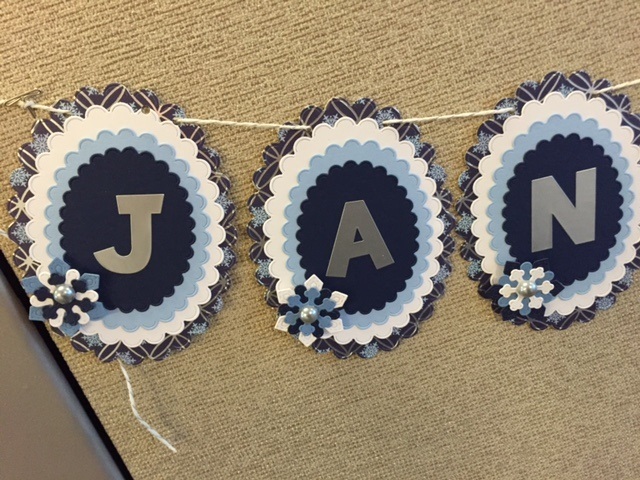 I have challenged myself to do more crafty things in 2016 & I am starting with monthly banners for my cubicle at work. To make my January Banner I used the Scallop Oval Die Set & Winter Die Set. I love how easy the dies are to use & layer. Stay tuned for future monthly banners! I love this I so want these dies!!!! WOW! This is such a BEAUTIFUL banner!! The colors are gorgeous and just love the idea of using the dies like that~the layering is so pretty! This is SO AWESOME! LOVE the colors and the way you added the snowflakes in the corners! Love yiur banner! So pretty! This is beautiful and what a fun way to dress up your office!!! How cute! What a fun way to brighten up your space! Katie this is a darling banner!